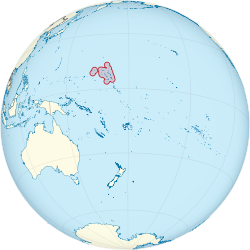 The Republic o the Marshall Islands (RMI) /ˈmɑrʃəl ˈaɪləndz/ ( listen), is a Micronesian naition o atolls an islands in the middle o the Paceefic Ocean, juist wast o the Internaitional Date Line an juist north o the Equator. The population is aboot 62,000. In 1986 unthirldom wis attained unner a Compact of Free Association wi the Unitit States.